Wood pallets have become a popular source of material for upcycling into a range of products. When looking for free wood pallets or working with them, safety precautions should be considered to ensure a successful project outcome. 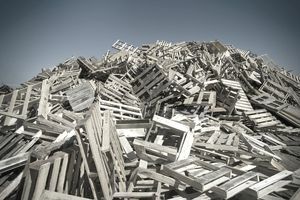 A number of articles about pallet safety place top priority on finding pallets that have an ISPM-15 stamp or other stamps such as EPAL to confirm that pallets that are safe to use. This advice is nonsense. While pallet markings are important to the people mentioned above, for the crafter, pallet stamps are in reality, not a top priority at all. The ISPM-15 heat treatment stamp indicates that the pallet as a whole or its indvidual components have been charged in a heat chamber to the required temperature for the required length of time. While this treatment eliminates insect infestation at the time of the application, it does not help the prospective pallet crafter in understanding the subsequent history of the pallet, and the potential exposures that may have followed. Another oft repeated and curious cautionary note is to avoid pallets with an MB (methyl bromide) treatment stamp. In the first place, you are highly unlikely to find an MB stamped pallet in North America, and in the second place, the MB quickly dissipates with an open air environment. MB treatment is not going to cause a problem unless you are working in an enclosed area, and that you somehow obtained the pallet immediately after treatment, which is extremely unlikely. (Think of carbon monoxide from your automobile on the open road versus in an enclosed garage as an analogy of sorts). Several pallet articles discuss the threat of "chemical" treated pallets. Pallet treatment isn't a problem. The main chemicals used on pallets are mold treatments and MB. The MB dissipates upon air contact, and mold treatments (which are applied to some HT stamped pallets, contrary to some advice) dissipate in 15 to 30 days, long before the affected pallets will end up in the hands of pallet crafters. Some of the better articles on finding safe pallets do offer good advice with respect to sourcing pallets that look clean and which do not have evidence of spills or other contaminants, albeit too often buried behind semi-relevant information about pallet markings and chemicals. Where possible, look for new condition pallets that appear clean and dry. Additionally, source pallets from supply chains where there will be less risk of contamination. Fast moving consumer goods supply chains are often good sources, but even here, pallets can be subject to spills of milk or other products. Take the time to inspect pallets. More likely you will find pallets that are weathered and with some degree of soiling, and these will work well for some projects. Keep in mind that you do not want to have people in a position to have their skin potentially punctured by slivers from bacteria-harboring wood, or to display such wood in an indoor setting if it is potentially moldy. (Read my article on pallet mold here.) There have been cases where slivers from dirty pallets have caused blood infections. With respect to mold, one temporary pallet art installation in a public building had to be quickly dismantled when it spread mold spores throughout the building. One of the aspects not stressed enough is that of handling safety. When handling pallets or working with them, be sure to wear appropriate safety equipment, such as puncture-proof gloves and safety shoes. Clothing that covers legs and arms will make them less susceptible to slivers. Proper lifting is important, as well as effectively securing pallets for transport. Employ general woodworking safety precautions for crafting, including the use of safety glasses and particle mask.